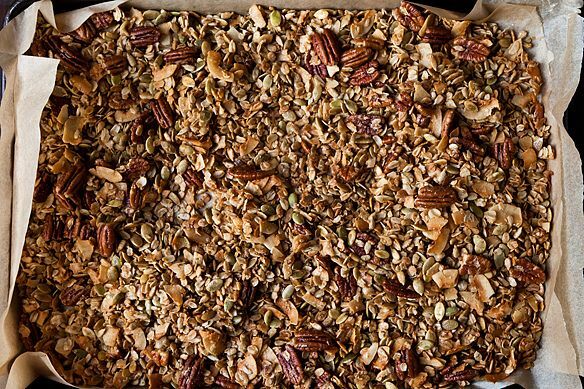 Today: The sweet-savory granola that's setting a new bar. Nekisia Davis was working 60 hours a week managing franny's, the famous pizzeria in Brooklyn, when she started baking, bagging and selling her own granola at local markets like the Brooklyn Flea. Her southern grandmother had to first talk her out of the name "Neki's Nookie". "Looking back," Davis says, "My grandmother was right." The new name Early Bird Foods, inspired by an old fruit crate label, suited her better. 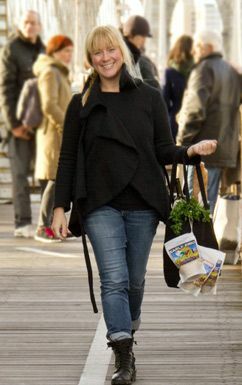 Three years later, she has a team of 10 and her granola is sold in 17 states. As granolas go, hers is like muesli after a vampy makeover. Olive oil, maple, brown sugar and salt form a rich, shaggy crust on wholesome innards, like the oats, pecans, coconut shards, and various seeds in her best-selling style Farmhand's Choice (see recipe below). It leans sweet, but olive oil fills out the savory undergirding in a way vegetable oil (the granola standard and a total wallflower) never could, and the salt keeps it from cloying. Making it at home requires pretty much only stirring. Oats and whatnot go in a bowl (stir), then go into the oven (stir, stir, stir). Granola! At 300 degrees for 45 minutes, you get absolutely no clumping or burning, and the nuts and things slowly bake up to a toasty crackle. 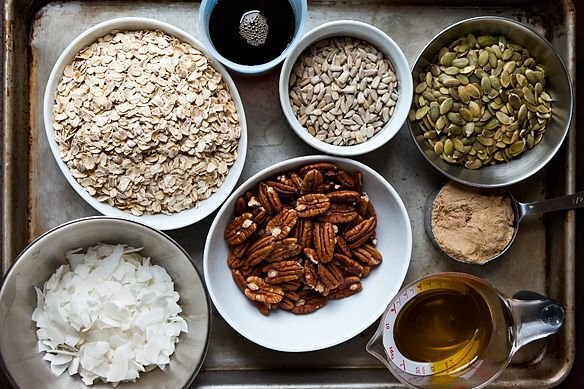 FOOD52er vvvanessa (who inspired me to try it) says, "It's the only granola recipe I ever bother with anymore." From the Flea, both Davis' products and her method quickly garnered fans in high places. Martha Stewart was one of the first. Then Melissa Clark. 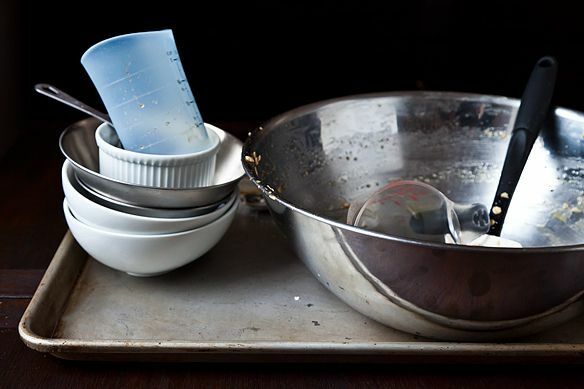 Then Daniel Humm, who not only told GQ it was one of his favorite things, but also began producing a version of Davis' recipe in the kitchen of Eleven Madison Park to distribute en masse. Other overachieving restaurants will offer a parting gift of a perfect bundle of truffles or pâtes de fruit, but Humm (a chef known for his sea urchin cappuccino, suckling pig tasting menu, and 3 Michelin stars) sends every diner home with a jar of low-tech granola smattered with pistachios and dried sour cherries, very much like Early Bird's Jubilee. It's a rare moment of homespun joy in a night of impossible excess -- and a testament to the bar that Davis' recipe has raised. Pick up some of Early Bird's other goodies like Choc-a-Doodle Doo -- coconut! chocolate? granola! -- and Crack of Dawn B-bars, topped with Maldon sea salt, here. I recently had a beautiful root salad that was topped with what the restaurant called olive oil muesli. It was similar to having candied nuts plus. I want to recreate this but am wondering about using so much brown sugar and maple syrup. Would love to hear suggestions. Thanks! It was great! I add just 1/2 cup of maple syrup without sugar and it was sweet enough (and I LOVE sweet). has anyone got any ideas for healthy alterations for the 3/4 pure maple syrup - home made apple sauce, natural runny honey?? this is the best granola i've ever had, hands down. I added 1.5 cups of dried fruit after it was finished baking (dried blueberries and currants) and loved the extra texture and sweetness. even granola haters loved this. I've made this several times now, exactly as listed, and have gotten the most amazing reviews. Everyone just loves it and wants the recipe. Thanks so much! i made this today but with some changes. it's the perfect granola recipe. thanks so much for sharing it!!! what a fantastic recipe. i used it as a base but changing the sweeteners. i recently bought back discs of coconut palm sugar from the malay markets in singapore and used that instead. definitely the most perfect granola i've made. 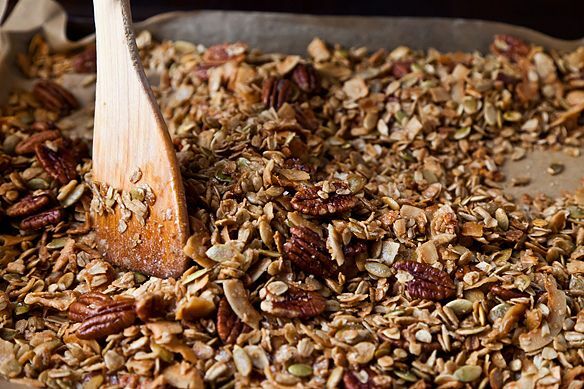 Good basic recipe, I personally like dried fruit in my granola, and less nuts. I added a few handfuls of dried currants after toasting the granola,. Next time I will use slightly less sugar and mix up the variety of the add ins. I love this combination of seeds with coconut flakes, but holy crap is it ever too sweet! Next time I think I will skip the brown sugar altogether with. 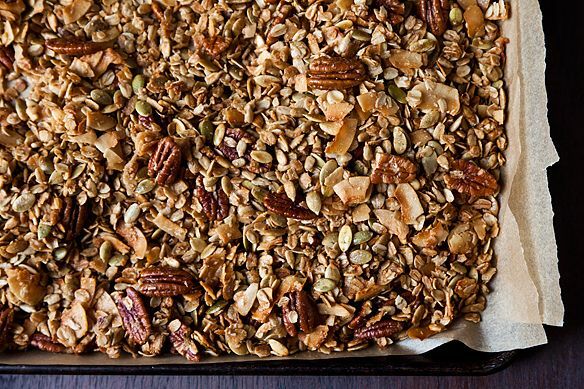 I've tried many great granola recipes, but this one is the best hands down. In my favorite version I use a mix of slivered almonds, walnuts and pecans and add dried cherries and golden raisins. Yum. May I know what other ingredients I can use in place of the aforementioned? Thank you for the help in advance! How interesting! 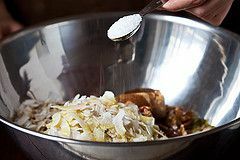 Unsweetened shredded coconut would be your next best bet, or you could try sweetened coconut while decreasing the maple syrup and/or brown sugar. Or you could just leave it out, or swap in more of any nut or seed you please. 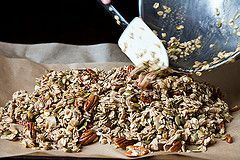 you TOTALLY can skip the coconut...i never add it in to any granola recipes (not even to this masterful, amazing one)....and i think it comes out just dandy. This is a wonderful recipe! The olive oil adds a wonderful flavor. I made the granola without the brown sugar and used only pecans, coconut and currants (no pumpkin seeds or sunflower seeds). It was plenty sweet enough without the sugar, as the currants and maple syrup added just enough sweetness for my taste. Great googley-moogley this is some good granola! When I made it, I used sucanat instead of the brown sugar and a rounded teaspoon of kosher salt. I love the use of olive oil in the granola as well. I can see why it's the only granola vvvanessa makes, and as others mentioned, it is wonderful with whole Greek yogurt. Any ideas for a substitute for the pecans? My daughter loves granola but is allergic to nuts...I normally substitue sunflower seeds in recipes but that might make this oversunfloweryseedy. I'd just replace it with an extra quarter cup each each coconut, sunflower seeds, and pepitas, then add an extra 1/2 cup of rolled oats. You could also consider pine nuts. 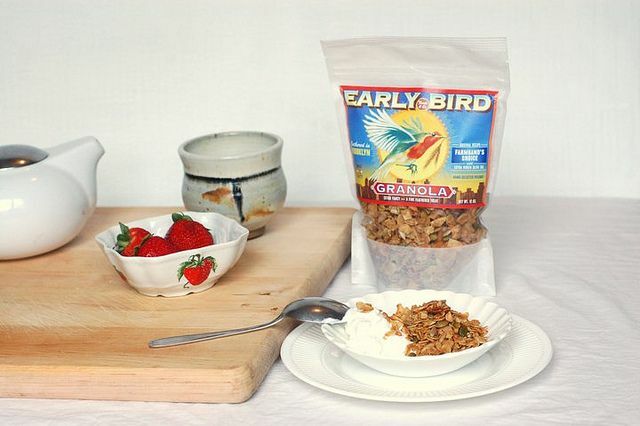 I've been trying to recreate the flavor and texture of EMP's granola since I had it last year. This recipe does the trick perfectly! I was missing a few ingredients but couldn't wait to try it, so used walnuts, almond slivers, dried cherries and some wheat germ. Best granola I've ever made! I've favored the old Tassajara cookbook's granola recipe for years, but decided to try this, although going with what I had on hand: sliced almonds, oats, sunflower seeds, some flax seeds. Absolutely delicious, although I'll probably try cutting back some on the maple syrup and brown sugar next time. Thanks for this! !